Sat Nam and Welcome to a place where my passions as a sacred musical artist and healer are shared, to serve and uplift humanity. Here you will find music to soothe your heart and lift your spirit. Enjoy sacred songs called Shabads & Mantras from the HEALING page for self-healing opportunities of body, mind, & spirit. Explore and discover the abundant, ancienttools and information here designed to nourish your life and soul. Check out my inspired NEW BLOG POSTS! 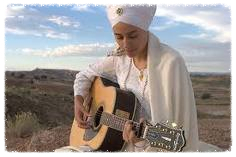 NEW ALBUM WITH SNATAM KAUR! The song that I'm on is called 'Pooran Jot'!' Enjoy! Fundraising: Our newest album, "Divine Woman," is available for purchase with the profits going directly towards our musical endeavors. Check it out!